Looking for simple projects for you or your small group to do to show God's love in a practical ways? 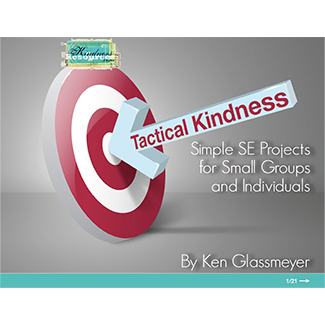 Ken Glassmeyer has complied his top 20 servant evangelism projects that can be done by a single person or a small group of people. These sure-fire ideas will get you and your group excited to serve! Each project has a brief description as well as the needed supplies to make it happen. I was very lucky as a new Christian. The very first small group I attended was very serious about doing acts of kindness in the community. Before I knew it I was involved in regular weekend outreaches that began with a bunch of us just loading a pick-up truck full of supplies that we had either bought or gathered ourselves and then we just went out looking for people to serve. That early model fit with my intuitive experience as a high school football player. You go to the huddle, get a quick play called, break, and go out and do your job. Likewise, small groups are the best way to achieve outreach tasks. It isn’t that church wide, large-scale outreach events are bad (I used to be in charge of such events when I was on staff at the church) they just are not the final destination of an effective approach to ministry. Small groups are the perfect vehicles to use to effectively reach your community. They are mobile, and can be self-sufficient. They don’t require large investments of time and energy and other resources from the church. Over the years I have led small groups that have touched hundreds of lives just from the money people threw on the kitchen table after we finished our bible study and agreed to meet back and go out find people to serve. It doesn’t require a bunch of sophistication to do this. You find a felt need in your local community, and then you go out and fill it. There is no set script. Genuine, casual chatter will do the trick until the person you are serving connects with what you are saying. You will actually find that many will engage you in a conversation just to satisfy their curiosity.